This tall waterfall fountain is accented with LEDs, for indoor or outdoor use. The stunning naturalistic design of this hand-painted, tall floor fountain features water that flows down a stack of flat rocks, illuminated all the way with soft LED accent lights. This peaceful home water feature is designed for use indoors or outdoors; constructed of weather-resistant fiberglass and high-quality parts that will last. Each piece is hand-finished in magnificent detail, so each is a one-of-a-kind creation. Pump, cord with plug, and all necessary pieces are included; plugs into standard outlet. 33" wide x 24" deep x 51" high. Weighs 83.6 lbs. Illuminated tall rainforest waterfall floor fountain. Natural stone and aged wood finish. Each piece is hand-finished with distinctive shading, coloring and texture. Resin, stone powder and fiberglass construction. Pump, cord and all necessary parts included. Multi-stream flow. 1500 GPH (gallons per hour). A rustic, natural look for indoor and outdoor use. How many total amps does this draw? BEST ANSWER: Hi - Unfortunately the manufacturer was not able to provide the amps. But, they were able to provide the pump specs of 99 watts, 120v/60Hz, 1500 GPH. I turn the pump off at night. In the morning all the water has drained out. Why would the water be gone? The second drop of water on the left side splashes out of the fountain when it hits the bottom pool . i tried slowing down the water but it still did it, any suggestion on how to stop it? BEST ANSWER: Hi Charles - You can try adding more water to reduce the drop height from the second drop to the bottom of the pool. I do not think it will stop the splashing, but it may possibly reduce it. Thanks I will try that. Can I control water flow? BEST ANSWER: Yes, the pump has a water control valve. how many gallons per hour does the pump pump? BEST ANSWER: Hi Charles - based on the pump that comes with this design, this would be around 1,500 gallons per hour. i want to locate the fountain on my dock over the canal and put the pump in the canal with a overflow into the canal do you see a problem? BEST ANSWER: In order to place the pump outside the fountain, you would need a longer hose (which we don't sell). Also, since the fountain is designed to have the pump inside the reservoir, the pump might not perform as well. The further the pump the lower the water pressure will be. what does the back look like to access to the pump and does the pump and lights have two different plugs ? BEST ANSWER: The pump and the lights have two separate plugs. The back of the fountain has the same finish and rock design that the front has except that there is no water flow in the back. The cords do come out of the back of the fountain where there is a sliding door. How much does this fountain weigh? BEST ANSWER: This fountain weighs 83.6 lbs. Can this withstand freezing temperatures without cracking? BEST ANSWER: No, we recommend to store the fountain indoors when it reaches temperatures below freezing point. 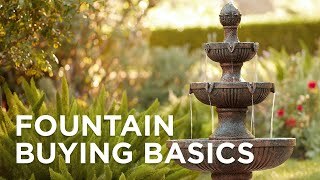 I'm looking for a tiered fountain that is somewhat "noisy," to drown out other outside noises ie barking dogs. Does this particular "fit the bill" per what I am looking for? BEST ANSWER: Yes, this fountain is loud enough to drown out most ambient noises that may be considered a nuisance. Can the water flow be seen from all sides? BEST ANSWER: The water flow is only at the front of this fountains. The back is finished in the same texture and color but no water on the back. is there a drain for winterizing? BEST ANSWER: There are no drains for this fountain. You will have to pour the water out. How many gallons of water is in the fountain? BEST ANSWER: Hi - approximately 16 to 18 gallons. A vintage feel with updated lighting makes this antique cross indoor-outdoor LED bubbler fountain a spectacular option. This vintage square LED indoor-outdoor fountain is a natural choice for traditional garden and interior spaces. Capitalize on a custom garden design or interior space with this three-tier LED water fountain. You&#39;ll love the Mediterranean-inspired visuals of this three-tier LED outdoor floor fountainas it brings a taste of Barcelona to your home garden.